I am so pleased the asparagus season has begun! 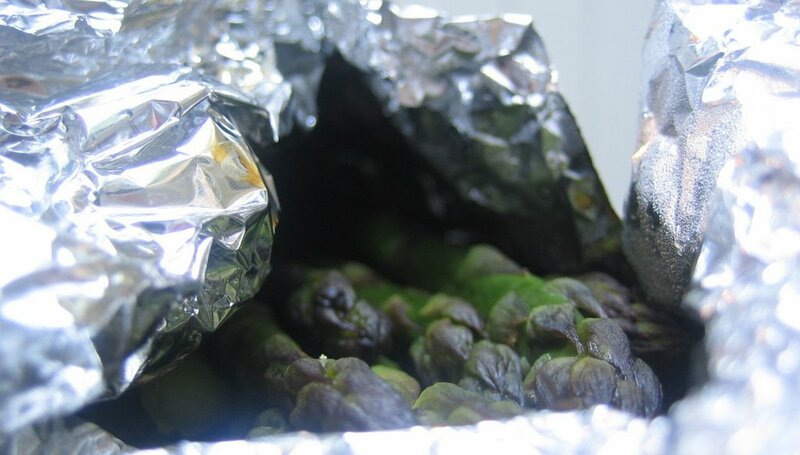 And the easiest way to cook some asparagus to go with the roast chicken you are having for dinner is to wrap the wet-from-washing spears, sprinkled with a little salt and pepper, in foil and pop in the oven for about 5 minutes. Lovely! No boiling, steaming, heating an element or washing up, just using what you already have going. No mess, great. I saw some white asparagus at the Hospitality Show today. Not sure if will be sold in the shops or only available to the restaurants. hmmm...Asparagus. I love it when the seasons on. We've had some last night with salmon and mash kumera... yum!! I really like the no-washing-up method, but I do love to set them on a baking sheet with some olive oil, salt and pepper and roast till the spears are blistered. I like that slight char, but this is so simple! During the week most of our cooking is on the grill. About halfway through what ever is being grilled I put the tin foiled asparagus onto the grill for the remaining 5-7 minutes of cooking. Always gets high marks. I think asparagus is such a good quick vegetable - and a treat, every single time, too! Barbara - I have only seen white asparagus in jar in fancy food shops - were the ones you saw in a jar or fresh?